All good things must come to an end. Actually, they don't really have to, but in this case, they are. Today is the last Steampunk Thursday. Yes, you can have a moment. Mary at Three Years of Roses and I have had fun bringing you steampunk goodness every week. She covers the last topic today, Steampunk Art and Artists. Go read and hopefully be inspired. 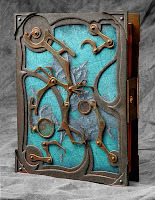 Oh... My... Gosh... That is one of the most beautiful journals I have EVER freakin' seen.